The Haryana government courted controversy when it asked sportspersons employed by it to deposit one-third of their earnings from commercial and professional commitments to the state sports council but put the notification on hold after drawing sharp criticism from elite athletes. 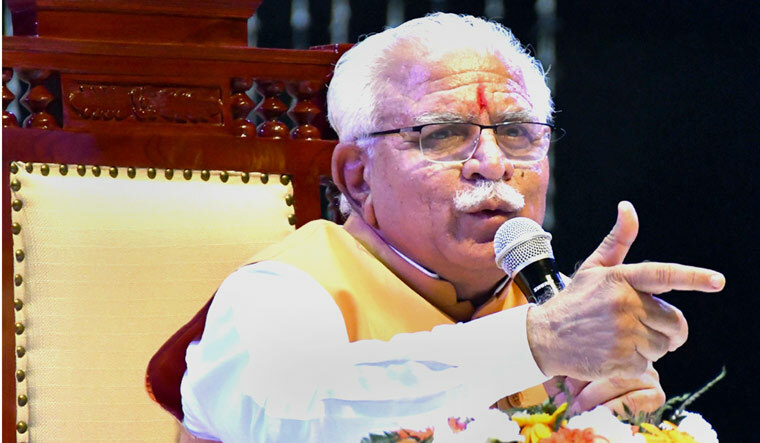 "I have asked for the relevant file of Sports Department to be shown to me & the notification dated April 30th to be put on hold till further orders," Haryana Chief Minister M.L. Khattar tweeted. "We are proud of the immense contribution by our sportsperson & I assure them of a just consideration of all issues affecting them," he added. His intervention came after athletes reacted sharply to the notification issued by principal secretary (sports and youth department), Ashok Khemka. "One-third of the income earned by the sportsperson from professional sports or commercial endorsements will be deposited with the Haryana State Sports Council. The money shall be used for the development of sports in the State," it stated. Khemka had hit the headlines during his stint as head of land registration department by alleging irregularities in land deals involving Robert Vadra a few years ago. Sports and Youth Affairs Minister Anil Vij also defended the move, insisting it was not aimed at income generated from amateur sports. "... here we are talking about income from professional sports," he said. "It is government's old rule/service rule, Rule 56, as per which if any government employee generates commercial income or professional income, then he shall have to deposit one-third of such earnings," he added. The athletes employed with the state government include star boxers Vijender Singh and Akhil Kumar, both of whom are DSPs in state police, hockey captain Sardar Singh and wrestlers Geeta and Babita Phogat. Sardar, Geeta and Babita are also employed with the Haryana Police. Of them, Babita, who won a silver at the Gold Coast CWG, was the only one to react to the move, calling it disheartening. "This notification will hamper an athlete's preparation. How can the government give such an order? We pay taxes over whatever we earn and now this notification to pay one-third," Phogat said. "Can the government understand how much sacrifice an athlete and his or families have to make to earn a medal for the country? The Haryana government should immediately take this order back and review it," he added. Some other Haryana athletes, not employed with the state government, also reacted with shock. "I have not yet seen the notification, I am only coming to know of it through media reports. I can only say that the athletes who compete in Olympic sports are already from very poor families," said double-Olympic medallist Sushil Kumar, who is with the Railways Sports Promotion Board. "The government should make policies which encourage athletes. I haven't heard of such a policy anywhere else in the world. The athlete should be competing with a free mind, not with stress like this," he added. Fellow wrestler and Olympic bronze-medallist Yogeshwar Dutt, also a Railways employee, was harsher in his criticism of the move. "God save us from such officials, who are taking senseless decisions like this. Their contribution to development of sports in Haryana has been zero but I am sure, they will play a big role in the decline of sports in the state," he tweeted. "Now, athletes will move to other states and these officials will be responsible for this," he added. There were political reactions to the move as well with Haryana Congress president Ashok Tanwar saying that the move will demoralise the players. The party's Rohtak MP Deepinder Singh Hooda said the present government has made a mockery of the state's athlete-friendly policy. The Haryana government had earlier stirred up a controversy when it decided to reduce the prize money for those Commonwealth Games medal winners from the state who were employed with other departments or states. The felicitation function planned for the prize money distribution on April 26 had to be eventually cancelled indefinitely when the athletes threatened to boycott it.